I'm at Saint George English Bookshop and see a book about Russian avant-garde in fiction. P. tells me he's reading a new book about Eastern Europe. "It's really good but also super specific," he says. I buy Frank O’Hara’s Meditations in an Emergency. 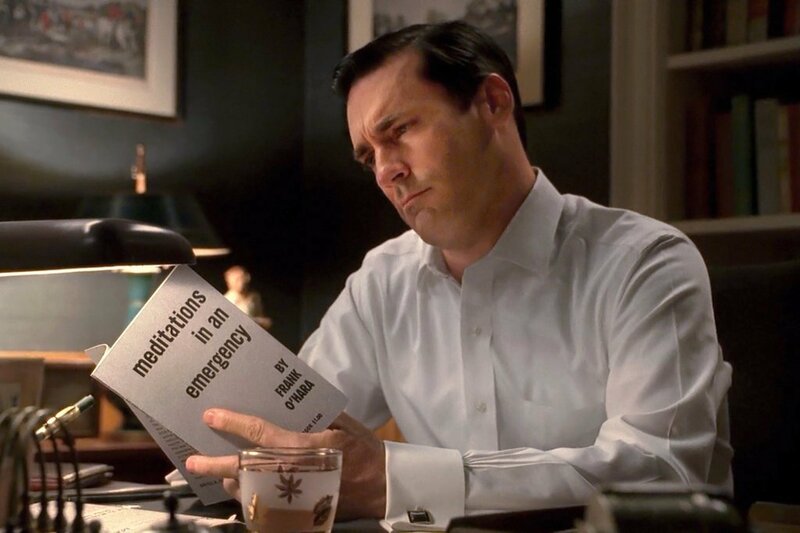 When I come home, A. tells me it was used in an episode of Mad Men, in which Don is in a bar and sees somebody reading the book. “Is it good?” Don asks. “I don't think you'd like it,” replies the man. But at episode's end Don is reading “Mayakovsky” and in voiceover it's quoted: “Now I am quietly waiting for the catastrophe of my personality to seem beautiful again, and interesting, and modern." I also buy Renata Adler's Speedboat, published in 1971, about a journalist who thinks "tepid" and "arguable" several times a day. It starts with a quote from Evelyn Waugh's Vile Bodies: "'What war?' said the prime minister sharply. 'No one has said anything to me about a war. I really think I should have been told....' And presently, like a circling typhoon, the sounds of battle began to return." I get a present for A. at St George. P. calls it a "stocking stuffer." It's a book with recipes from American expats in 1920s Paris. Josephine Baker's one is called Naked Lunch. I'm bored on the subway so I'm reading what my neighbour is writing on WhatsApp. First it's about a burglary that apparently happened to his friend. He gives an example of his ex who had a burglar who was hiding in the hallway. He then continues: "WhatsApp schreibt. Es gibt einen neuen Update."